A looping masterclass is something I’ve been asked about a lot over the years, but until now, I’ve only done them in Universities. So, no time like the present, I’m doing on as part of the ‘Beyond Bass Camp’ series here in Birmingham, on July 29th. But it’s not just for bassists – it’s for any instrument, or indeed voice. All you need to have is your instrument and your looper of choice. So why do a masterclass in looping? Looping (or ‘live looping’ as it’s often named, to differentiate from the studio technique) has become SO popular over the last decade, largely thanks to the work of artists like Imogen Heap, KT Tunstall and Bill Frisell. It’s been around a lot longer, with people like David Torn, Robert Fripp, Brian Eno, Eberhard Weber and David Friesen experimenting with it for much longer. There seem to be two initial defaults for ‘music that incorporates looping’ – either floaty ambient stuff, ala Robert Fripp’s soundscapes, or singer-songwriters looping the chords to their songs, and writing songs where the chorus and verse work over the same chords. Both have lead to a whole load of great music, but there are SO many more arrangement possibilities (as the recent emergence of so many beatboxing loopers has proven). methods for keeping loops sounding ‘fresh’. and using a looper in the studio. With plenty of time for answering questions and exploring whatever comes up in the class! Each class will be limited to 5 students. It will run from 10am til 6pm with a break for lunch and coffee/tea breaks. The cost for each class is £75 and includes lunch. Payable in Advance – payment confirms your place. 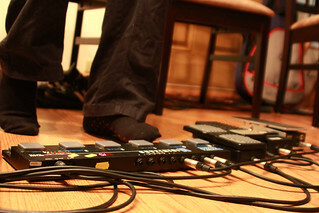 All you need to bring is your instrument, looper and a cable (and if you have them, you’re welcome to bring any other pedals you use) – amplification will be provided. To register an interest, email/tweet/fb me, state which class you want to attend, where you’ll be coming from, any relevant musical background stuff and your preferred payment method, along with contact details and any food allergies/exclusions. Notes: This class is available to any instrumentalist/vocalist, not just bassists (though bassists are most welcome!) To reserve a place, contact me to let me know you’re interested, then payment can be made by paypal or bank transfer to confirm the place.